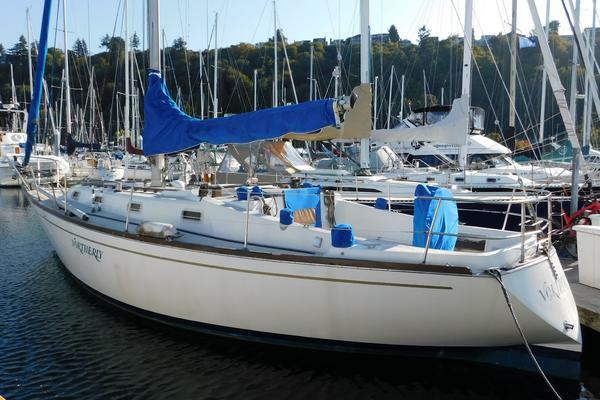 United Yacht Sales New Jersey would love to guide you through a personal showing of this 30' Tartan 3000 1985. 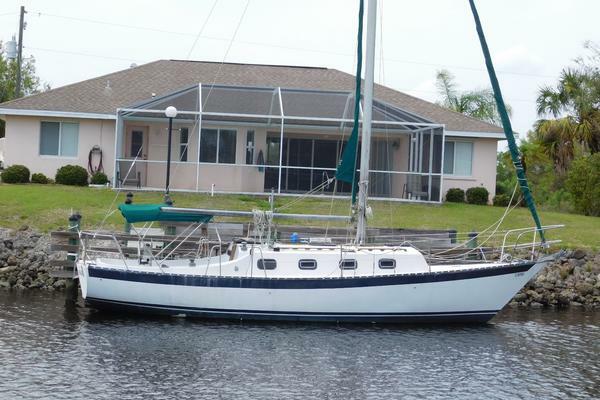 This yacht for sale is located in Pasadina, Maryland and priced at $29,500. For a showing please contact us by filling out the form on this page and we will get back to you shortly! COCKPIT:The roomy cockpit features a Edson pedestal helm with a stainless steel wheel, binnacle with a Richie compass engine throttle/gear shifts and wheel break. A teak cup holder with insert teak table is mounted on the forward side of the helm. A Raymarine GPS Chart Plotter mounts to the hand hold above the wheel. Depth and autopilot instruments are mounted on the cabin-top bulkhead port of the companionway. The engine gauges and start-stop switches are mounted at the helm on the port side. A 12 vdc plug is found to the right of the engine controls, with a manual bilge pump mounted under the aft bench seat on the far port side.T-shaped seating for 7 is provided by port and starboard benches and a stern bench, raised at the center line for the helmsman. The fold up swim ladder is mounted on the stern, behind the helm. Lockers are found under the port and starboard side benches. Two Lewmar 40 Two Speed Winches are mounted port and starboard for jib trim, with two Lewmar 16 winches mounted on the cabin top. All running rigging lines lead aft to the cockpit. The cockpit is protected from sea spray by a Dodger. TOPSIDES:Moving forward the deck is protected by stainless steel bow and stern railings connected by dual lifelines running the length of the deck port and starboard; gates are found at cockpit on both the port and starboard side, with a third gate located in the stern rail, center. Teak hand rails run along the cabin top, port and starboard. Jib tracks are found on the port and starboard side decks. The main sheet track is located forward in the cockpit. There is one opening center mounted hatch on the foredeck and cleats are found at the bow and stern.The double spreader rig features a Harkin Cruising 1 roller furler and a boom vang. The standing rigging, with adjustable back stay, is stainless wire cable. MAIN CABIN:With a teak & holly sole, teak joinery and paneling throughout, main cabin is a warm and inviting space. Entering the cabin from the cockpit companionway, the galley is found to starboard and the chart table/nav station to port. Port and starboard settees with seating for seven, extend fore and aft along the length of the cabin. A fold down table is mounted on the forward, port bulkhead. Shelves with a center locker are found above the port settee, with a full length shelf above the starboard settee. Additional storage is found under the settees. On the starboard side forward there a countertop where a flat screen TV is found. Overhead lights and additional reading lights are found throughout the cabin. Ventilation is provided six opening portlights, three on each side, and two overhead dorade vents (not installed). A fan is mounted on the forward starboard bulkhead. A Marine Air reverse cycle AC/Heat system also installed. GALLEY:The L shaped galley is found to the starboard of the cockpit companionway. The countertop extends from the companionway to the starboard side then forward, and includes a stainless steel sink with hot and cold running water and a manual foot pump spigot. There is a locker underneath the sink with an additional counter top access locker found to the right of the sink. An ice box is built into the aft bulkhead above the sink. A storage bin and locker are found above and the starboard side counter, with a refrigerator mounted below the counter.NAV STATION:The nav station is found in the aft port corner of the main cabin and features a lift top table w/bench seat and map light. Above the table are two storage lockers, with the DC electrical panel found to the left. Along the rear bulkhead to the right of the table there is a shelf with a light and VHF Radio mounted above. The AC electrical panel and fuel gauge are mounted on the aft bulkhead behind the shelf. To the left of the shelf there is an additional locker with A/C controls, hand held VHF radio, battery charger and depth gauge controls mounted above. HEAD: The full beam head is found forward of the main cabin. A sink with hot & cold running water is found to port, with a mirror mounted above. Lockers are found to the right of the sink and underneath. An opening portlight is found in the sink area, along with a 120 vac outlet and 12 vdc light. A marine head is found opposite the sink area on the starboard side, with shelving and an opening portlight above.FORWARD CABIN:The private forward cabin features a V-Berth for 2 with storage compartments underneath. There is an opening hatch overhead and two aft bulkhead mounted reading lights. Access to the anchor locker is found all the way forward. ENGINE COMPARTMENT:The engine compartment is found under the companionway stairs.